September began and finally, after a long eight month drought, life has returned to normal. Alabama won last night. The lingering question was finally answered. We found out it’s Tua, not Jalen. Nobody was surprised. Only in this football mad state can a quarterback with a 26-2 won-loss record turn into a sympathetic character. Auburn won yesterday too. All is good in unarguabley the college football capital of the world. It’s business as usual in our little slice of Americana sports. While winning in Tuscaloosa and Auburn is expected, an unusual thing is happening sixty miles northeast of TTown and 100 miles west of Auburn. That’s right here in Birmingham, as UAB which didn’t have a football program two years ago, isn’t content anymore playing second fiddle to the big boys. UAB — that’s the University of Alabama at Birmingham — nestled as an urban university on the city’s thriving Southside, with an enrollment of over 21,000. It features a great undergraduate business school and medical and dental programs that take a backseat to none. Now football is looking to do its share to prop a school that once was a sleepy alternative to ‘Bama and Auburn but now is making a name for itself on the national stage. A sea change for the school’s athletic reputation began the week following the end of the 2014 football season when UAB President, Dr. Ray Watts, stunned the students, the administration, the players, the coaching staff and the entire city by announcing UAB was dropping its football program. That was despite finishing 6-6, their best record in ten years. While everyone was stunned — or pretended to be — the facts were nobody really cared about UAB football. Sure, they’ve had two first round NFL draft picks: Bryan Thomas in 2002 and Roddy White three years later. They’ve had two quarterbacks of note: Joe Webb, cut yesterday off the Houston roster, and a 2007 graduate who flunked a tryout with Kansas City and decided his voice and guitar were a much better asset than his throwing arm. Sam Hunt is now one of country music’s hottest tickets. UAB’s home digs, Legion Field, was once the most vibrant stadium in college football hosting the annual Iron Bowl as well as numerous Alabama and Auburn home games into the 1980’s. Today, it’s a shell of its former self. Part of the upper stand has been condemned and removed, reducing seating capacity from 83,00 down to 71,000. Before UAB football was killed, there were Saturday afternoons where maybe 6,000 were in the decrepit joint. It is located in a part of town you didn’t feel safe at high noon and neither would Wyatt Earp. The reality was for many years prior to the 2014 shutdown, the program while breathing, was really dead. Deader than a Chris Christie presidential run. Deader than an Colin Kaepernick invite to the Oval Office. D-E-A-D dead. With a minimum attendance of 15,000 mandated by the NCAA on a rolling two-year average needed to maintain Division 1 status, UAB was about to get tossed if something drastic didn’t happen. So the University trustees channeled their inner Jack Kevorkian and gave themselves a lethal injection following the ‘14 season. The two seasons prior to 2014 were perhaps the lowest in the history of UAB football lows. Their head coach, a Trumpian character with an ego larger than the man himself and a hollow sales pitch to boot, had no game. His two year record was 5-19 and there was a long line of boosters ready to help him pack his bag. Whether he left on his own or was shown the door doesn’t matter. Nobody cared anymore about the teetering program. If it was to be saved, it quickly needed to find solid leadership. Nobody was really impressed with the solution. 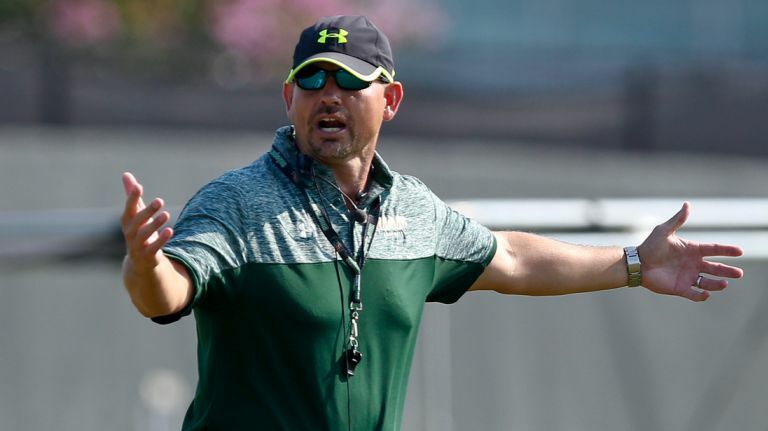 UAB hired a successful high school football coach who had a year of D-1 heading coaching experience down the road at Jacksonville State. Bill Clark reminded nobody of Lombardi. Or even Rich Kotite. Hindsight said the administration knew the program was in grave danger, which at the time explained the strange vanilla hiring with no big-time football history on his resume. Clark signed a five-year deal for what the brass must have known would be a one-year gig. But they got him for far less than what the cost would have been for someone with major program experience, so they could afford to eat the remaining four years if the program was scrapped while also gambling he would get a job and they’d be off the hook. Bill Clark turned out to not only be a very likeable guy but one heck of a football coach. His .500 season in 2014 was huge for a program that labored in the lower rungs of an also-ran football conference, Conference USA. 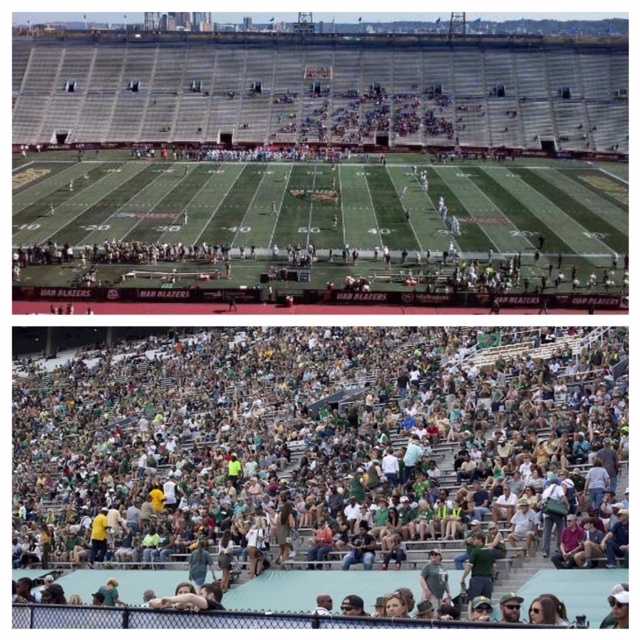 And even though UAB’s 2014 attendance didn’t keep pace with the wins, the on-field future of Blazer football brightened. Then the lights were shut off. The Blazers were never to play another football game following their 45-24 win over Southern Miss on November 29, 2014. The next day Sports Illustrated reported that UAB was planning to fire its athletic director and terminate the football program. Five days later, Dr. Watts made the official announcement. Players on scholarship cried; students were up in arms; boosters were incensed and a community that supported Alabama and Auburn and would never considering going to a UAB game all of a sudden cared. Dr. Ray Watts become the rallying point for what came next. At UAB home basketball games that season and the next, whenever an opposing player was at the foul-line, the fans would chant in unison “Fire Ray Watts.” It worked as UAB won the basketball conference both years. 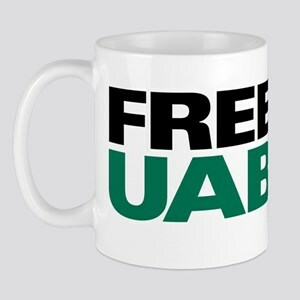 The students began a “Free UAB” movement to try and get the school out from what was seen as a Board of Trustees that was biased by the big time of the University of Alabama athletics and looked down at UAB as the runt of the litter, taking up time and money and never resulting in anything of significance, so the faster it was extinguished the better. There was probably more truth to it than not. Almost immediately after the killing of football a community campaign, a collaborative effort between big money blue bloods and the working blue collar, was begun to try and raise enough money to convince the trustees to reinstate it. I told anyone that asked me to not waste their time. There was no way. The program was dead. Deader than Nancy Pelosi’s invitation to a clothing optional weekend pool party at Mar-a-Lago. Dead. Seven months later an incredible $17 million was raised in donations, big and small, to convince the powers-that-be to reinstate UAB football. Another $22 million was later committed to build a practice facility that didn’t take a back seat to any program in the SEC making recruits feel like this can be big-time one day. On June 1, 2015, only months after it was declared clinically dead and the result of the greatest civic effort I’ve seen in my twenty years here, football was reinstated. President Watts and the trustees had no other choice. Birmingham had spoken. And while UAB wasn’t “free” from biased trustee influence, nonetheless it made a statement that had to be heard. Coach Clark turned down multiple D-1 coordinator jobs to remain at UAB and see his commitment through. Most kids on scholarship left to play elsewhere but when momentum began that this campaign had a chance, some stayed hoping to one day put back on the green and gold uniform. Clark, whose courage was just as strong as his conviction, was rewarded with a program to coach instead of a contract to run out. All agreed it would take two years to get re-started. Clark quickly amassed a staff and players. The 2017 season was a long way down the road but that road got shorter by the day. He turned out to be the right guy for the job. Brian Mackin, the former AD who became a victim of the coup, saw something in Clark that took a while for others to notice. Nobody was going to out-work or out-recruit him. He embraced the community that embraced him. He was a master motivator, so good in fact, that I asked him to address our staff during our annual January kick-off meeting in 2017. He was wonderful. And Bill Clark, fifty, is also one heck of a football coach with one heck of a future. Last season, UAB’s first one back, Vegas had their over/under win total for the season at three. UAB finished with a remarkable regular season record of 8-4, good enough for second place in Conference USA’s West Division. The city responded with an average attendance of 26,000 at dilapidated, ninety-year old Legion Field. They won all six of their homes games. The eight wins were an all-time program best and landed the Blazers only their second bowl bid ever with a spot in the Bahamas Bowl. Their only other one, in 2004, was in the Hawaii Bowl. This season they’d actually like to play one on the mainland. By no means, however, is the football program or athletic department on safe, solid financial footing like its brethren elsewere in the state. Playing as a mid-major and needing to ensure its financial future, UAB will need to play some ‘money’ games on the road each year against power conferences in return for a big check and hope to maybe steal a big win like Nicholls State did yesterday at Kansas. This year UAB has a November 17 date at Texas A&M in return for $1.6 million; win, lose, or cover. Next year at Tennessee. In 2020, the Blazers go to my alma mater and Miami will pay them two mill to take a pounding. I am still torn whether to wear a Miami shirt and UAB hat to that game, or a UAB shirt and Miami hat. I have time to decide, though I’ve already been told I’ll be UAB’s guest that day, which may impact my wardrobe decision. This past Thursday night Coach Clark was at his scheduling best. Looking to get the season off to a flying start, UAB paid Savannah State $275,000 to come to Birmingham to open the season. The Georgia school also got to keep forty percent of the revenue for tickets sold to their fans, which came out to about twenty-six bucks. Unfortunately the Tigers’ most famous alum, Shannon Sharpe, had no eligibility left. Over 27,000 turned out to see the Blazers win 52-0. SSU, 3-10 last season, completed three passes on Thursday night. Two of them were to UAB defenders. They take their dynamo to Miami next weekend for a much bigger check. It’s the same Savannah State that in 2013 went to Miami and the ‘Canes ran up 77 points in three quarters. Both teams agreed to a shortened twelve minute fourth quarter with a running clock. Fingers crossed Miami doesn’t overlook LSU tonight for Savannah State next weekend. —The city and county, along with private monies, have agreed to a build a sorely needed $175 million, 35,000 seat football stadium in the new entertainment district of Birmingham. It will become the Blazers home in 2021. Ironically, if Bill Clark continues his success for the next three seasons, he won’t be here to see it. —UAB was always a basketball school with a football program. It’s quickly transitioned to a football school with a basketball program. —Since the reinstatement of football, the “Fire Ray Watts” chants the past two seasons at basketball games while opponents shot free throws has stopped. Maybe it’s only a coincidence, but UAB in those two years hasn’t finished any higher than sixth in the conference. — Dr. Ray Watts, once public enemy number one on campus and on the verge of witness protection, was seen tailgating at the Savannah State opener on Thursday night. —And maybe the biggest indication that UAB football is now a part of the state’s fabric can be seen at Birmighham’s airport. On Concourse C, the apparel store that for the last half dozen years has sold nothing but Alabama and Auburn logo’d items, now has a UAB rack. And down here that is big. Very big. Amazing how things can change when a community gets together ! Good story ! ROLL TIDE ! Go UAB !